INDIANAPOLIS, Ind. — Junior Claire Mikesell (Clearfield) made her first trip to the NCAA Division II Swimming and Diving Championships one to remember by locking up First Team All-American honors with an Indiana University of Pennsylvania record in the 200-yard breaststroke preliminaries at the Indiana University-Purdue University Indianapolis pool Saturday morning. Seeded well down the list of qualifiers with a 2:17.80 time for her first attempt at the distance as a Crimson Hawk, she touched third in 2:14.80 to earn a berth in the finals, where she placed seventh in 2:15.57. 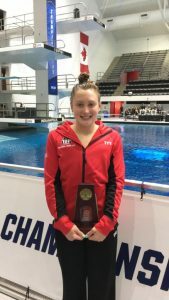 First Team All-American awards go to the top eight swimmers. The IUP record Mikesell broke was 2:16.46 set during the 2013-14 season by Allyson Mitidieri, who was the last Crimson Hawk women’s swimmer to achieve first team All-American recognition, tying for seventh in that event. Earlier in the four-day meet, freshman Paige Mikesell (Clearfield) attained All-American Honorable Mention as a member of the IUP 400 medley relay team that placed 16th in the prelims with a 3:46.76 to qualify for the consolation finals. Then, the Crimson Hawk quartet of Regan Chalk, Rachel Johnson, Mikesell with a 54.97 butterfly leg and Nicole Smith combined for a 3:46.16 to move up to 13th place. That clocking lowered the IUP record of 3:46.66 they had established during the Pennsylvania State Athletic Conference Championships in February. Claire Mikesell placed 21st in the 100 breaststroke prelims with a 1:03.32 which was less than a second shy of making the consolation finals. Paige Mikesell competed in three preliminary events, finishing 25th in the 200 fly in 2:06.26, 26th in the 100 fly in 55.92 and 45th in the 200 freestyle in 1:58.67. The Mikesell sisters were on 11 winning Crimson Hawk relay teams during the regular season. Paige touched first in nine individual races, while Claire earned wins in three events. AUBURNDALE, Fla. — Senior Jon Janocko (Clearfield) worked a two-inning save to close out Juniata’s 2-1 win over Suffolk (Mass.) last Thursday. Janocko gave up only one hit and one walk in that stint after pitching one clean inning in a 17-8 victory over Becker (Mass.) two days earlier. The Eagles were 4-3 for the week to break even, 4-4, for their stay at the RussMatt Invitational hosted by Central Florida. Janocko, who had a rocky first appearance on the spring-break trip, has allowed four hits, four walks and five earned runs in 3.2 innings. DUBOIS — Freshman pitcher Jake Sorbera (Clearfield) notched his first win with 2-1/3 innings of scoreless relief at Showers Field Sunday afternoon as Penn State DuBois salvaged a split against Mercyhurst North East for the second time in three days. The right-hander retired seven of the eight batters he faced, two via strikeouts, with one hit batsman. After Sorbera worked out of a jam with the visitors ahead 4-0 in the top of the fifth, the Lions rallied for three runs in the bottom of the inning and pulled out their sixth victory in 12 games with a pair of runs in the seventh. Sophomore Zane Morgan (Clearfield) drove in a run and scored one to cap a 4-for-9 series at the plate that lifted his season average to .389. Sophomore outfielder Thayne Morgan (Clearfield) had a pair of hits in a 9-3 loss Sunday and now owns a .400 average. Freshman first baseman Seth Bumbarger (Clearfield) made his third start in Sunday’s nightcap. He’s hitting .222 in six appearances. Zane Morgan is 7-for-18 with two RBIs and four runs scored in seven appearances, including six starts at either the corner infield or corner outfield positions. Thayne Morgan is 10-for-25 with a team-high seven runs in 10 games, nine of them starts at one of the three outfield spots. Junior pitcher Brandon Orsich (Clearfield) made his second start in Friday’s opener that the Lions also came from behind to win 6-4. He went four innings, striking out three while allowing five hits and three earned runs. Orsich won his only decision, and his earned run average is 4.09 for 11 innings. LAKELAND, Fla. — Junior outfielder Thomas Summers (Clearfield) pinch-hit for Southeastern (Fla.) in a 16-1 win over St. Ambrose (Iowa) Saturday afternoon. He is hitless in six plate appearances. The Fire, ranked No. 1 in the National Association of Intercollegiate Athletics (NAIA), are 26-3 and riding an 11-game winning streak. CLARION — Freshman infielder Brooke Cline (Clearfield) pinch-ran and scored a run for Clarion in a 10-9 loss to Gannon Friday. The Golden Eagles were swept by Gannon and Seton Hill on Sunday to fall to 0-19. Cline has appeared in 16 games, 10 of them starts on the left side of the infield, and has two hits and two runs batted in with three runs scored. MYRTLE BEACH, S.C. — Sophomore Ethan McGinnis (Clearfield) placed 24th in the long jump with a leap of 5.93 meters (19 feet, 5½ inches) at the Allan Connie Shamrock Invitational hosted by Coastal Carolina in Doug Shaw Memorial Stadium last weekend. He also wound up 49th in his first attempt at the javelin throw.